Summer is here and it’s time to make sure that your truck is ready for the season. Summertime creates excessive heat that can negatively affect your truck. 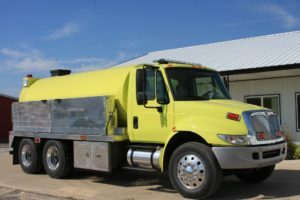 Osco Tank and Truck Sales decided to create a list of 5 maintenance tips you should use this summer to make sure your truck is running smoothly and safely. Making sure your air conditioning is working properly is important during summertime. If you hear any noises coming from the blower, it may need to be replaced. Take a look at the filters to make sure the condenser is clean and clear. Make sure to pay attention to hose fittings and bends, and flex points as well. Having a working air conditioning is important for your comfort! The hot heat of summer makes the rubber in tires break down faster. Be sure to check the tread depth of your tires, sidewall areas, and any cracks on the wheels themselves. Another thing to watch out for is tire pressure. Overinflated or underinflated tires can get too hot, leading to a blowout. Also, be sure to have your tires rotated approximately every 5,000 miles. Having a dead car battery in the middle of summertime is never good. When the weather is warm, battery sulfation occurs more quickly and heat corrodes the battery’s current conducting grids. It is important to be careful when handling the battery, but cleaning around it can help prevent problems in the future. Your battery’s lifespan may increase. Finally, try testing the battery cells often. Low readings may mean that it is time to replace your battery. Checking your oil is important. Depending on the type of truck you have and its usage, it will depend on how often you need it changed. Checking your hoses or belts under your truck is a good idea in the summer because they wear faster due to heat. The belt only requires a visual inspection. It should have proper tension and aligned correctly. When checking the hose, squeeze it near the ends. If it has a spongy feel to it, it needs to be replaced. Be sure to check only when your car is cool. At Osco Tank and Truck Sales, you and the safety of your truck are important to us. Be sure to examine your truck using these maintenance tips to make sure your truck is ready for summer. We hope that you have a great summer!